Despite the title of this blog I do occasionally read a current book, this one having been released in the U.S. within the past month. I have never read any of Alain de Botton’s previous work, but I recently had the good fortune to hear him speak on the topic of Religion for Atheists, and afterwards I immediately purchased the book. I generally don’t enjoy reading books on atheism because usually the authors are telling me something I already know (evolution is real, the Bible contains inaccuracies, the Church has done bad things, etc.). De Botton, thankfully, has moved beyond this tedious bible bashing and has written a book that is actually useful. While the trend in philosophical thought in the past century has been towards a more analytical concentration on theoretical minutiae, far removed from the concerns of the general public, de Botton is one contemporary thinker who strives to find practical ways people can use philosophy to enrich their everyday lives. In this book, he applies this perspective to religion, asking what lessons can non-believers learn from the religious world that would actually be beneficial to their personal well-being and to society as a whole. He acknowledges the given fact that religions are based on false mythologies, yet proposes that all religions were invented by humans and are thus humanistic in that they were created to address fundamental human needs. De Botton uses terms like “spiritual” and “soul,” a poor choice of terminology in an argument addressed toward atheists, but essentially he’s talking about basic psychological and social needs like community, mutual compassion, support through times of hardship and stress, and a healthy perspective towards the insignificance of one’s own problems. Even though atheists don’t believe in a deity, they still share these needs and must find a way to address them. The secular means of accomplishing this is through culture—philosophy, literature, art, and so on—yet no secular school of thought has ever attained the level of popularity, influence, or fervor enjoyed by the world’s major religions. De Botton investigates why this is so. For simplicity’s sake, he only focuses on three religions: Christianity, Judaism, and Zen Buddhism. He is concerned less with the messages these religions have to offer than with the media by which their messages are disseminated, promoted, and propagandized. He cites examples of the ways religions use ritual, art, and architecture to reinforce their teachings, and examines their educational methods and institutional organization. De Botton goes on to propose specific steps he feels would be necessary for an atheistic or humanistic ideology to compete with or supersede the domineering influence of religion on society. This would involve revamping the world’s universities, art museums, and public architecture, and would also require some institutional organization on the part of an atheist movement. Organization is a frightening word to most atheists, as they envision de Botton pushing a new dogma to replace the old, which nevertheless would also repress free thought. In reality, however, he’s merely proposing a situation similar to that which existed in ancient Greece, in which philosophical schools like the Stoics, Cynics, or Epicureans encouraged community among like-minded individuals and mutual assistance in personal growth, as opposed to the state of atheism today in which everyone is holed up in their own apartments reading books, the contents of which will soon be forgotten. At no point does de Botton ever tell anyone what to believe. Instead he encourages individuals to construct their own belief systems by selecting relevant lessons from amongst the various schools of secular and religious thought. De Botton’s writing is lively, entertaining, and crystal clear throughout. No extensive prior knowledge of philosophy or religion is required to enjoy this book or learn from it. Much of what de Botton has to say is common sense, but like a lot of great philosophy, if you concentrate enough common sense between the covers of one book, sometimes it approaches genius. This is the fourth novel in Zola’s Rougon-Macquart series about life during the Second Empire in France. Unfortunately, it is a lesser-known work, long out-of-print (though one can find it in ebook form now). While this book is not one of Zola’s masterworks, it certainly doesn’t deserve the level of obscurity into which it has fallen. The story takes place in the fictional town of Plassans, in Provence. A new priest comes to town, Abbé Faujas, and he and his mother rent a room in the home of the Mourets (François Mouret of the Macquart family, and his wife Marthe Rougon). At first stand-offish and shy, Abbé Faujas soon learns the amount of social and political influence that a clergyman can wield in a small town, and he starts to get more and more involved in the affairs of Plassans. He also starts to insinuate himself more and more into the lives of his landlords, much to the chagrin of François Mouret. It’s an election year, and as various politicians and church officials play a kind of chess game for the votes of Plassans, the once meek and mild Abbé becomes more power-hungry. Is it possible his previous mild-mannered behavior was just an act to conceal a hidden political agenda? This book has a light-hearted satirical tone overall; it’s not one of Zola’s deep, philosophical works. Those who have read The Fortune of the Rougons will enjoy the depiction of Plassans and the further development of some of the characters that appeared in that first book. The characters are engaging and the plot has some surprises in it. Zola seems to have had fun writing it, and it is a fun ride for the reader. This beautiful little volume, a slim 60 pages, may be the best book available on the Prairie Print Makers. Officially formed in 1930, this confederation of print makers was founded by ten Kansas artists: C. A. Seward, Birger Sandzén, Leo Courtney, Charles M. Capps, Lloyd C. Foltz, Herschel C. Logan, Clarence Hotvedt, Edmund M. Kopietz, Arthur W. Hall, and Norma Bassett Hall. The book begins with an introduction describing the formation, mission, and activities of the group, along with a brief synopsis of its history. This is followed by short biographies of the ten founding artists. 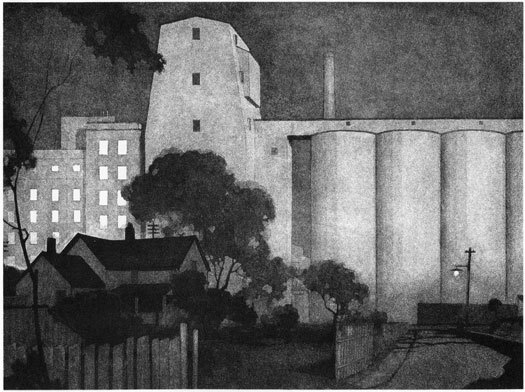 Most of the founders started out as graphic artists working for print shops in Wichita or Topeka, with the notable exception of Sandzén, an art professor born and educated in Sweden who became one of the greatest artists ever to call Kansas home. 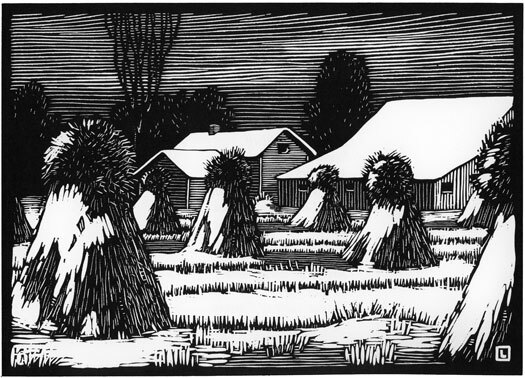 The art that the Prairie Print Makers produced was of a regional realist style. They worked in all print media: woodcut, linocut, etching, aquatint, drypoint, lithography, and even serigraphy in the later years. Their by-laws stated that art produced for the organization should be derived from nature, thus landscapes of Kansas were prevalent, but many of the artists also had connections to the Taos, New Mexico art scene, so southwestern imagery was also common. Eventually the group grew to include artists from all over the U.S. and even Canada, including Luigi Lucioni, Stow Wengenroth, Clare Leighton, and Maynard Dixon. The book does not discuss these later members in detail, only lists their names, but it does include about a dozen images from artists outside the original ten. This brief 9 x 12" saddle-stitched booklet is well designed and printed in two colors, black and tan, on high quality paper. The 72 illustrations are reproduced big and beautiful in black and white, with some duotones. (Norma Bassett Hall was the only founding member to print extensively in color.) This book was published by a gallery in Wichita, and for that reason is probably intended to serve more as a collector’s guide than a biography of the group. Thus the accounts of the artists are entirely positive with copious details of their accomplishments, sometimes reading more like resumés than biographies, but they are penned in a sufficiently lively style that genuinely inspires enthusiasm for these artists and their accomplishments. The Prairie Print Makers produced some of the finest art ever to come out of the American midwest. They deserve a full-length scholarly monograph with 200 full-page illustrations. Until we get that, this is the best reference on the subject. The authors did an admirable job with this book. It is a valued volume in my collection. Birger Sandzén, Smokey River, lithograph, 12 x 18"
Herschel C. Logan, Fodder in the Shock, blockprint, 5 x 7"
Charles M. Capps, Moonlit Mills, aquatint etching, 7.5 x 9.5"
Originally published in 1836, Ralph Waldo Emerson’s essay Nature had a profound impact on American literature and philosophy. Prior to this work, the arts of the Western world had been built upon centuries of cultural history, and American culture was little more than a redundant reflection of past civilizations. 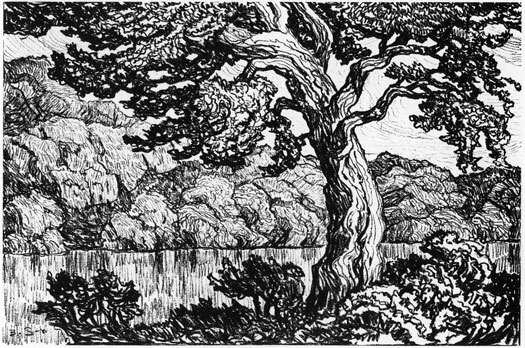 Emerson argued that, with the abundance of raw, untouched wilderness in the New World, American writers, artists, and scholars possessed a rare opportunity to build a uniquely American aesthetic, based not on the achievements of the past but drawn directly from nature itself. At the time, the concept of nature was little developed in the public psyche. Most people thought of nature simply as the provider of meat, produce, and timber. Emerson championed the appreciation of nature not only for the value of its commodities but also for the sake of its moral and spiritual benefits. The philosophy that Emerson espouses in Nature reads like a mixture of the dualistic idealism of Plato and the monistic pantheism of Spinoza. Like Plato, Emerson believed that there is a higher reality, a divinity, that exists outside of the physical universe we perceive with our senses. Emerson refutes the assertion by many idealists, however, that sensual nature is simply a deceptive illusion which conceals true reality from us. Instead, Emerson insists that nature is the medium through which the divine speaks to us, that it is only by observing and loving nature that we can truly experience God. By accumulating empirical data of the natural world around us, we are able to ascertain the laws which govern the universe. It is through this exercise of reason that mankind is truly able to glimpse the divine. Thus, religions that emphasize an unseen kingdom of heaven over the perceptual world of nature do a disservice to man. Though Emerson was a Unitarian minister, the God of which he speaks does not resemble the Judeo-Christian deity, but rather a pantheistic universal soul which is synonymous with reason. Divinity is present throughout the universe, in all things, including humanity. Mankind must accept the fact that they themselves are a part of God, and having done so must live up to their own godliness. Emerson talks much of Spirit, which would lead one to believe he held a dualistic view of the universe, but since he provides a pantheistic conception of Spirit as an all-embracing unity that permeates the entire universe, it would seem, arguably, that he considers Spirit an inherent property of matter, and that the two substances of matter/spirit exist within one entity, rather than in separate realities. Nature serves as the de facto manifesto of the Transcendentalist movement, as it is the most concise and comprehensive encapsulation of that movement’s ideals. To contemporary readers, the most familiar expression of Transcendentalism is Henry David Thoreau’s Walden. The appeal of Emerson’s work has not held up as well over the years as that of his protégé Thoreau, primarily because the language Emerson uses is far less accessible. Emerson liked to couch his philosophical concepts in poetic metaphor, and in Nature he even goes so far as to confess that he finds ambiguity more inspiring than clarity. Hence, Nature makes for a difficult read. To some extent it’s too poetic to be good philosophy, and too philosophical to be good poetry. Nevertheless, this brief book is loaded with passages of extreme beauty, eloquence, and wisdom. The time spent deciphering this complex work will be handsomely compensated by a rich yield of inspiration and enlightenment. If you liked this review, please follow the link below to Amazon.com and give me “helpful” vote. Thank you. This is Jack London’s third collection of short stories, first published in 1902. As with his two prior collections, all of the stories are set in northwestern Canada or Alaska at the time of the Klondike gold rush. The common thread uniting these ten stories is that they all prominently feature Native American or Inuit people. London’s treatment of Native American characters is somewhat paradoxical. On the one hand, he was one of the first authors to treat Indians as human beings with real thoughts and emotions, even giving them starring roles in some of his best stories. On the other hand, he often inserts a paragraph or two extolling the superiority of the white race, the destiny of the Anglo-Saxon man to triumph over the Indian, the preferability of a white woman’s charms over those of an Indian maiden, and so on. London considered the white conquest of the Americas to be inevitable, yet he still sympathized with the plight of the Natives and lamented the loss of their culture. Because of the touchy subject of Native/White conflict, often his best Indian stories are those that don’t feature white characters at all. Thankfully, this collection features several of such stories, and in general the questionable ideas on race are kept to a minimum. For the most part these are very well-crafted and exciting wilderness adventure stories which begin to show the Darwinian-based philosophical beliefs that London famously presented in The Call of the Wild. To reinforce his obsession with “the survival of the fittest” and “the law of tooth and claw,” London uses the Indians as a symbol of a people and culture less removed than the whites from the natural order of things, and thus less removed from the brutal impartiality of life and death inherent in the wild. “The Law of Life” is one of London’s absolute masterpieces. As an Indian tribe packs up their camp to move to winter hunting grounds, one feeble elder is left behind to die. In his last moments, he meditates on life and death with neither fear nor bitterness, for such is the law of life. “Keesh, Son of Keesh” tells the tale of a young Indian male ostracized by his own kind for adopting the non-violent ways of the white man’s Christianity. London vividly depicts the clash of cultures within one man’s soul, with surprisingly brutal results. In “Nam-Bok the Unveracious,” a more light-hearted tale of culture clash, a long lost young Indian male returns to his village on the Bering Sea. As he regales his kinsmen with tales of the white man’s world, they respond with incredulity and suspicion. In “The League of Old Men” London tackles the subject of white conquest by offering the point of view of an Indian, on trial for murdering white men, who justifies his crimes as a defense of his endangered native culture. There really are no bad stories in this book, just a couple below average efforts that are far outnumbered by the good and the great. Children of the Frost is a strong collection of stories, a treat for lovers of London, and a good introduction for those who have never read his work. Lu Xun (a.k.a. Lu Hsun) is considered the father of modern literature in China, and his work has had a profound influence on the arts of his native land. For the Western reader, the more you know about Chinese history and culture the more you will understand and enjoy these stories. This is best illustrated by Lu Xun’s most famous work, “The True Story of Ah Q”. Considered a masterpiece in China, it tells the story of a clueless ne’er-do-well who stumbles his way through the transition from an old imperial regime to a new revolutionary government, suffering a series of humiliations along the way. It’s obviously a satirical piece, though Westerners with little knowledge of Chinese history and politics may have trouble figuring out what exactly is being satirized. While some of the broader themes in the story are apparent, for the most part I felt like a Tibetan yak herder trying to make sense of Huckleberry Finn, Don Quixote, or Candide. The same holds true for the last two stories in the book, “The Flight to the Moon” and “Forging the Swords”. Both are based on myths or folklore, and in both cases, the metaphor escaped me. Despite these few moments of culture shock, throughout the remainder of the book Lu Xun’s skill as a storyteller is evident, and his keen perception of the human condition imbues these stories with a universal appeal that defies cultural boundaries. Most involve a first-person narrator, an educated city-dweller, presumably Lu Xun himself, who travels back to his home village to visit his family. There he meets an old friend, relative, or acquaintance who reminds him of a lost memory from his past. These are often bleak tales emphasizing the negative aspects of Chinese society in the early 20th century: peasants held down by a restrictive class hierarchy (“My Old Home”), women locked into a system of marital customs little better than slavery (“The New Year’s Sacrifice”), intellectuals persecuted for their political leanings (“The Misanthrope”), and the relentless futility of folk medicine and traditional religious practices in solving people’s problems (“Medicine” and “Tomorrow”). Though Lu Xun was a radical leftist, his stories do not carry any blatant overtures in favor of communism or any other political creed. They are, however, loaded with blatant condemnation of the old feudalistic order of the Qing Dynasty. When Lu Xun writes about his childhood, he does show some fond nostalgia for the old Chinese customs (most notably in “Village Opera”), but as an adult intellectual he clearly advocates the abandonment of the antiquated social order in favor of more modern, Western-influenced ideas. This collection presents a fascinating view of Chinese culture at a revolutionary turning point. Any lover of literature with an interest in China will appreciate these well-crafted and emotionally moving stories. With Fire and Sword is a sweeping, romantic, historical epic, originally published in 1884 by Nobel Prize-winner Henryk Sienkiewicz. Though little read by American audiences, this book deserves a place of honor alongside such classics as The Three Musketeers, War and Peace, Doctor Zhivago, and Les Miserables. The opening chapters required a little historical research just to figure out what was going on, but once I got my bearings it was a great ride. The story begins in 1647, and takes place mostly in the Ukraine, which was part of the Polish-Lithuanian Commonwealth, at that time the most powerful nation in Europe. The novel follows the events of the Hmelnitski Uprising (This review is based on Jeremiah Curtin’s English translation, so I’m using his spellings of proper nouns). Bogdan Hmelnitski led a Cossack Revolt against the Commonwealth, with the aid of the Tartars (Muslims from the Crimea). Pan Yan Skshetuski is a lieutenant in the Commonwealth forces led by Prince Yeremi. Shortly before the uprising Yan meets the love of his life, Princess Helena. As the fighting breaks out they are separated and spend most of the novel trying to get back together. One major obstacle to their reunion is Bogun, a fierce and powerful Cossack leader who also loves Helena, and takes her captive. Pan Yan has three comrades-in-arms: Pan Michal Volodyovski, Pan Longin Podbipienta, and Pan Zagloba. These four soldiers display a friendship similar to the four comrades of The Three Musketeers, with Zagloba providing most of the comic relief. If there’s a weakness to this book it’s the plotting. The great adventure classics by Hugo or Dumas are intricately crafted so that each chapter is crucial to pushing the story forward. With Fire and Sword feels like it has quite a bit of filler. There are several chapters of the heroes drinking and talking about how they should all go look for the princess, but very few chapters of the heroes actually looking for the princess. About six instances occur of characters coincidentally running into Bogun, when two probably would’ve sufficed. Despite these few low points, the book overall is very exciting, and filled with memorable characters and events. This novel contains some of the most vivid and gruesome depictions of warfare ever written. If they gave a prize for most impalements in a novel, Sienkiewicz would surely have won it with this entry. Atrocities are committed by both sides, beheadings are commonplace, and the torture of prisoners is routine. At one point, as the Commonwealth forces are approaching a town of particularly rebellious peasants, Yeremi instructs his soldiers to “Kill them so that they know they are dying,” a philosophy that permeates the book. I don’t want to make it sound like it’s all blood and guts; Sienkiewicz also shows us the political intrigue behind the military strategy. And let’s not forget, this is, after all, a love story. This is the first book in a trilogy of historical novels by Sienkiewicz. The second volume is The Deluge (aka Potop), and the third is Pan Michael (aka Pan Wolodjowski or Fire in the Steppe). After reading the first book, I can’t wait to tackle the other two. Gladys March does well to preserve Rivera’s fictions; it is not her job to censor him. She does not get off scot-free, however. Not only does she take Rivera’s stories and translate them from Spanish to English, she also takes the words of an intellectual visionary and translates them into the language of an eighth-grader. The short, choppy sentences and elementary vocabulary make for uncomfortable and occasionally tiresome reading. There are factual errors, as well, which could be attributed to March rather than Rivera. The artist and educator Gerardo Murillo, who called himself Dr. Atl, is here referred to throughout as Murillo Atl, as if that were his given name. At one point Rivera talks about painting a 40 x 65 foot mural at the Ministry of Education. There is no forty-foot-tall Rivera mural in that building, so he must have been talking about some other building, perhaps the National Palace? Later, while Rivera discusses the “painting” of his mural at the Teatro de los Insurgentes, never once is it mentioned that the finished mural is not a painting but, in fact, a mosaic. These are a few examples of confusing discrepancies of fact which distract from the already distracting self-mythologizing of Rivera. Despite these shortcomings, the true value of this book becomes evident when Rivera discusses the creation of his art, his growth as an artist, and the development of his artistic philosophy. On these subjects he is frank and forthright. Because of my admiration for Rivera as an artist and my fascination with Mexican culture and history, it’s almost impossible for me not to like a book on this subject matter, especially when it comes from the mouth of the master himself. As far as Rivera biographies go, however, I prefer The Fabulous Life of Diego Rivera by Bertram Wolfe. Although Wolfe was a friend of the artist, he’s not afraid to point out Rivera’s faults. Here the only fault Rivera will own up to is his ill treatment of women. (As appendices, the book includes brief statements by each of Rivera’s four wives, providing a welcome dose of reality.) This book does have its flaws, and after reading it I must admit my estimation of Rivera may have dropped a notch or two, but those interested in Mexican art will appreciate this unique glimpse into the mind (and ego) of a genius. First published in 1888, Looking Backward was one of the most popular books of its day. It inspired several utopian communities and hundreds of “Bellamy Clubs” across America. Reading it today, it’s hard to see what all the fuss was about. Through a convoluted series of circumstances, wealthy Bostonian Julian West falls asleep in 1887 and wakes up in the year 2000. Upon awakening he is greeted by Dr. Leete, who will serve as his host and guide in this future society. The social order has changed drastically since West’s day. America is now governed by an idealistic form of socialism, though Bellamy avoids the S-word in favor of terms like “cooperative”, “rational”, or “brotherly”. It’s not a strict Marxist socialism, but rather Bellamy’s own brand. The overall governing principle is that cooperation is more efficient than competition. The trusts that dominated America in the late 19th century have eliminated each other through competition and consolidated into one giant trust, now governing all industry. This trust has somehow become the U.S. government, and now beneficently works for the interests of all citizens. The military has been replaced by the Industrial Army, all industry has been nationalized, money has been abolished, and all citizens receive identical wages in the form of credit which they are free to spend however they choose. Bellamy’s society of the future sounds a lot like an early prospectus for the Soviet Union read through rose-colored glasses. In reality, its existence would require the total negation of all human greed and sloth. It is also heavily reliant on a benevolent ruler who wields absolute power. Unfortunately, as history has shown us time and again, those who wield absolute power are seldom benevolent. My main objection to this book, however, is not directed toward its political ideals. I generally enjoy reading the socialist literature of this time period, and I’m usually up for a good utopian novel of any political stripe, no matter how far-fetched. What I object to is the writing. Once West wakes up in this brave new world, how does he spend his time? Sitting on the couch talking to Dr. Leete, chapter after chapter after chapter. Occasionally they go out to a restaurant, store, library, etc. where all they do is talk, talk, and talk some more. What’s the first rule of good writing? Show me; don't tell me. If your intention is to teach us about an ideal industrial society, why not give the man a job? Julian West is not an active participant in the society being described. He doesn’t interact with it at all. He is a perpetual bystander. This is really not a novel at all, but a series of dialogues in which Dr. Leete is the mouthpiece spouting the imaginary Constitution of Bellamy’s ideal America. Would we all be happier living in Bellamy’s world? Probably. But that doesn't make it a good book. This novel, the third in the Rougon-Macquart series, is a great example of what Zola does best. Through his minute attention to descriptive detail, he creates a setting based on historical fact, peoples it with an ensemble cast of realistic characters, and before we know it we are entangled in their lives as if we were one of the neighborhood. In this case the neighborhood is Les Halles, the huge marketplace of Paris, and the cast is composed of fish mongers, butchers, bakers, vegetable sellers, and street urchins. The two main characters are Lisa Quenu (born Lisa Macquart, daughter of Antoine Macquart), and her brother-in-law Florent. Florent, a Republican who’s had some trouble with the law, seems to be an embodiment of Zola’s feelings toward the revolutionary movement of the time, both positive and negative. Lisa, who runs a butcher shop with her husband, represents the moderate French citizen of the era, far more interested in the comforts and challenges of everyday life than in the events of the world outside her own immediate surroundings. While Florent entertains grandiose Utopian visions of a socialist France, politics is the last thing on Lisa’s mind. Her main concern is keeping up the appearance of relative prosperity, thereby winning her family a bit of social status within the neighborhood. Depending on which edition you read, this book is either titled The Belly of Paris or The Fat and the Thin. The second title refers to two types of people in the world. On the most obvious level it could simply refer to the division between the Haves and the Have-Nots. But Zola explores the dichotomy on a deeper level, separating mankind into those who are concerned foremost with creating a comfortable life for themselves, preoccupied only by the immediate world around them (The Fat) and those who have an outward concern toward the world, life, and humanity as a whole, living a life of sacrifice—whether deliberate or not—because of a devotion to a higher cause, whether it be political conviction, art, or some other calling (The Thin). Zola doesn’t pick sides, but rather points out the strengths and foibles of both types. This novel is not a masterpiece, and it won't have the kind of profound effect on you as some of Zola’s better books (Germinal, La Terre, L’Assomoir). It is an engaging read, however, and can certainly stand as a worthy sidekick alongside Zola’s greatest works.